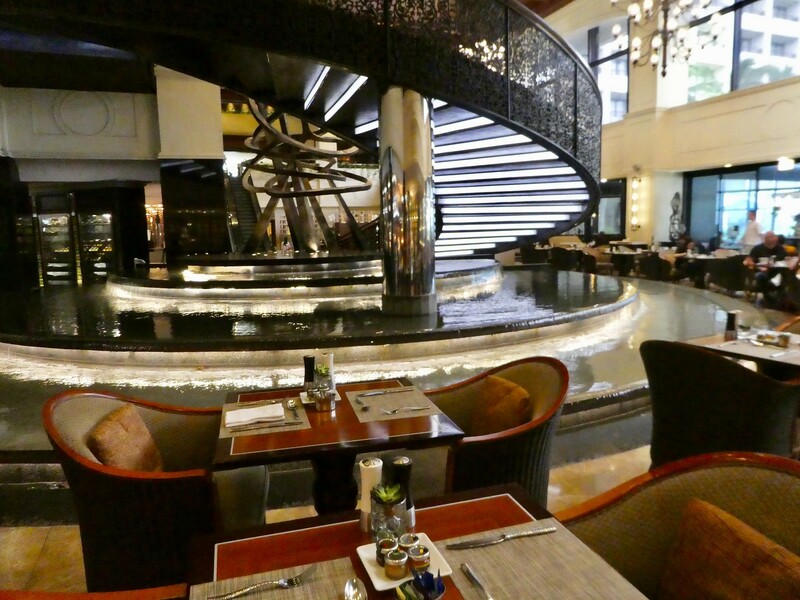 After showering in our luxurious bathroom we headed downstairs to the Spiral restaurant for some breakfast where we were spoilt for choice with a vast selection of dishes. There were so much to choose from that it was difficult to know where to begin. In one corner there was even a temperature controlled cheese room which seemed to have even more varieties of cheese than a specialist cheese shop. I started the day with a freshly made oat and honey smoothie before sampling the buffet. It was a delicious breakfast and I’m certain we both over indulged. It was after 10.00 a.m. by the time we finally left the hotel, setting off on foot along the now familiar bayside path. 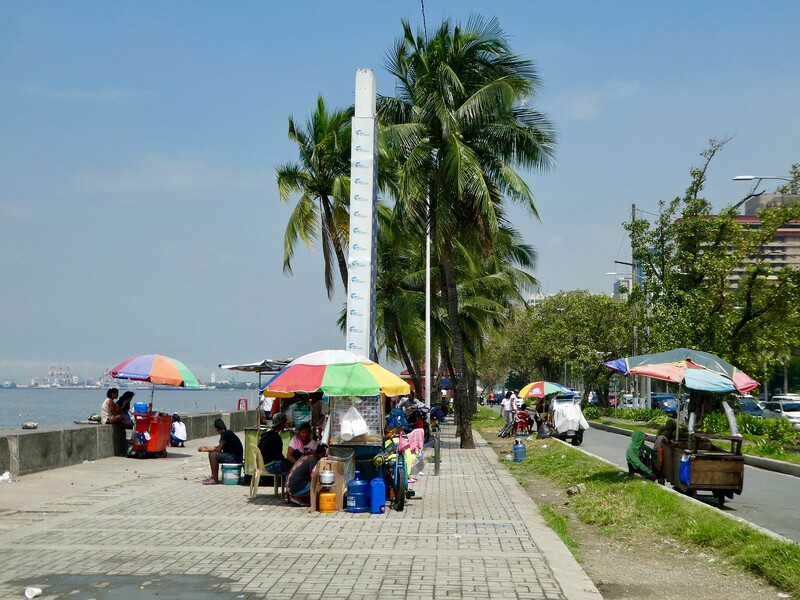 It was a pleasant place for a morning stroll and continuing much further than the previous day along Roxas Boulevard, we passed numerous small food stalls along the promenade. Few people seemed to be around on this Friday morning except for a couple of men on horse drawn carts who kept pestering us to take a ride. Rather than taking no for an answer, they kept lowering the cost but eventually got the message that we weren’t interested and moved on. As we approached Rizal Park we noticed a significant police presence with officers at the ready with their battle shields. There didn’t appear to be any sign of disturbance so we politely enquired what was happening and were told that it was the National Day of Protest (21st September). This is marked annually by a series of rallies, demonstrations and meetings espousing a variety of causes. Unfortunately for us, Rizal Park was closed due to security reasons disrupting our plans. 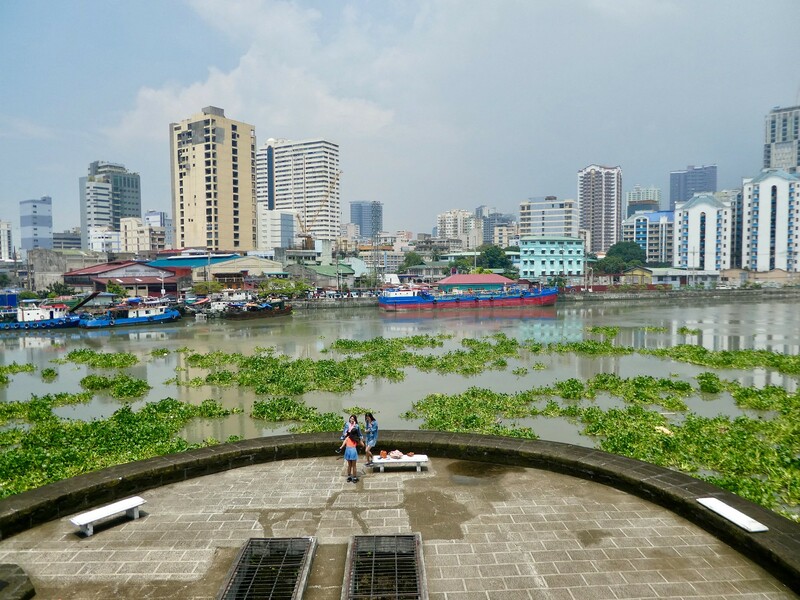 Instead, we continued on to Intramuros, and by the time we reached Fort Santiago we were ready for a drink so we visited the small cafe there before looking around. 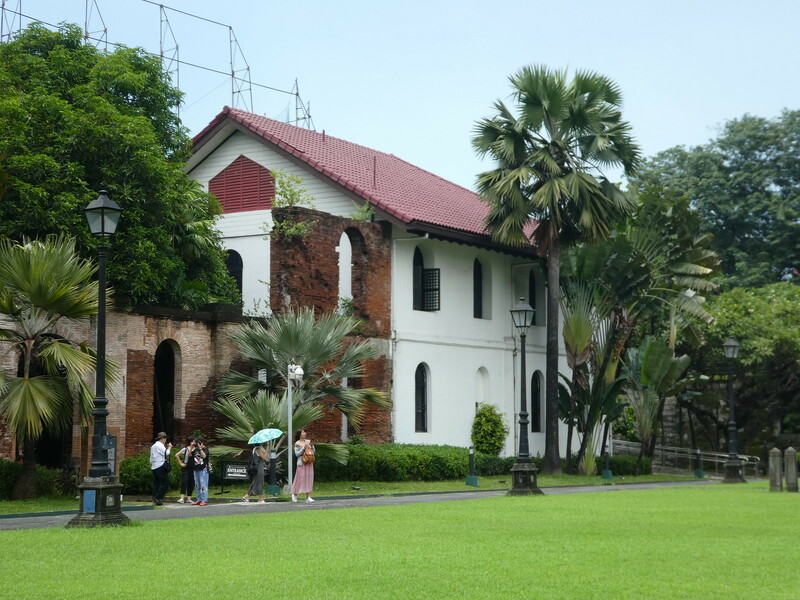 Intramuros is the historic centre and oldest district of Manila and is also known as the Walled City. Stone walls and fortifications stretching almost three miles almost completely surround the district and although they were badly damaged during the Battle of Manila in 1945 many have now been restored. 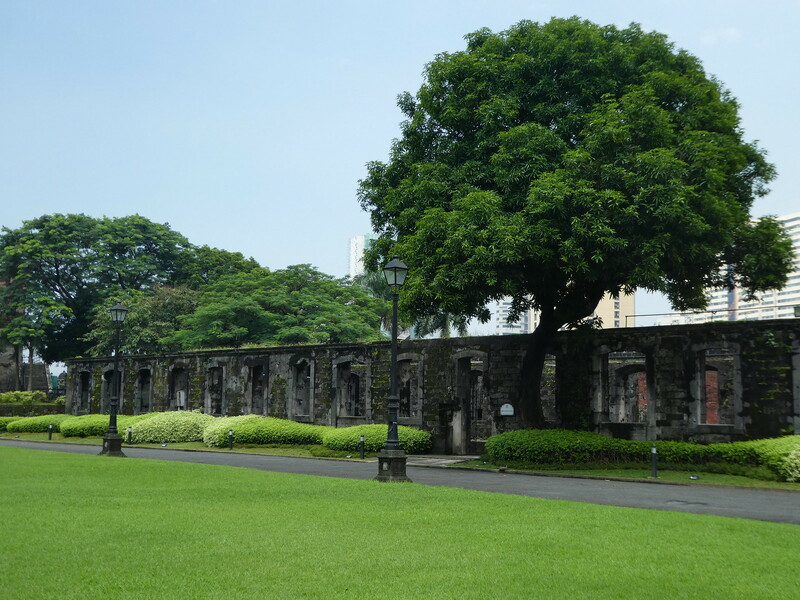 From the city’s foundation in 1571 to the end of Spanish rule in 1898 Intramuros was Manila and served as the capital of the Spanish East Indies. 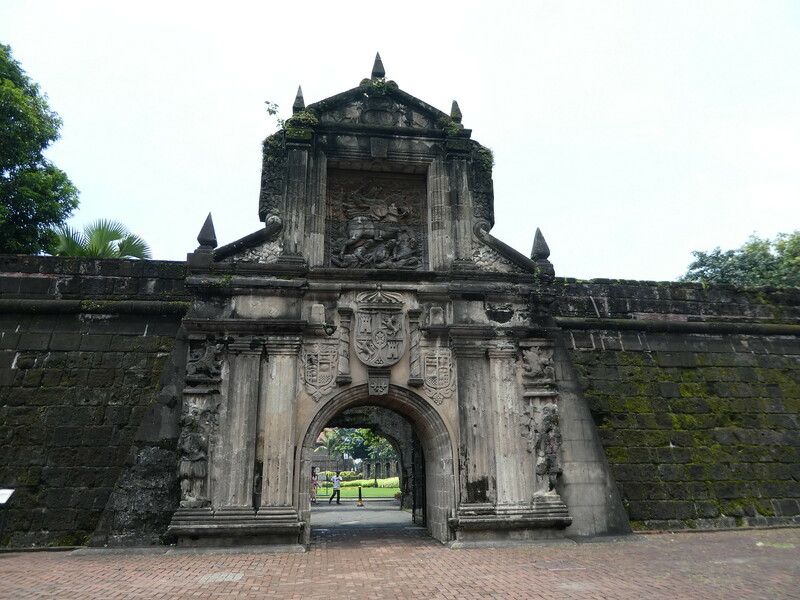 Except for a brief period under British rule between 1762-1764 Intramuros remained a Spanish city. Admission to Fort Santiago is 75 Peso (£1) and it was interesting to explore its old walls, buildings and dungeons. The former military headquarters of the Spanish colonial government. Although the fort sustained very heavy damage during the war, parts of it have now been restored including its iconic gate. The ticket also included the church which didn’t look like a church at all from inside. Here we found a display of entries from a Lego competition. These were of official buildings in Manila and each one had been skilfully designed and were interesting to look at. Climbing up to the lookout point on the roof of the fort we could see tree debris floating down the river following the recent typhoon. The river was flowing quite fast but there was no end to the sea of green, it just went on and on as far as the eye could see. 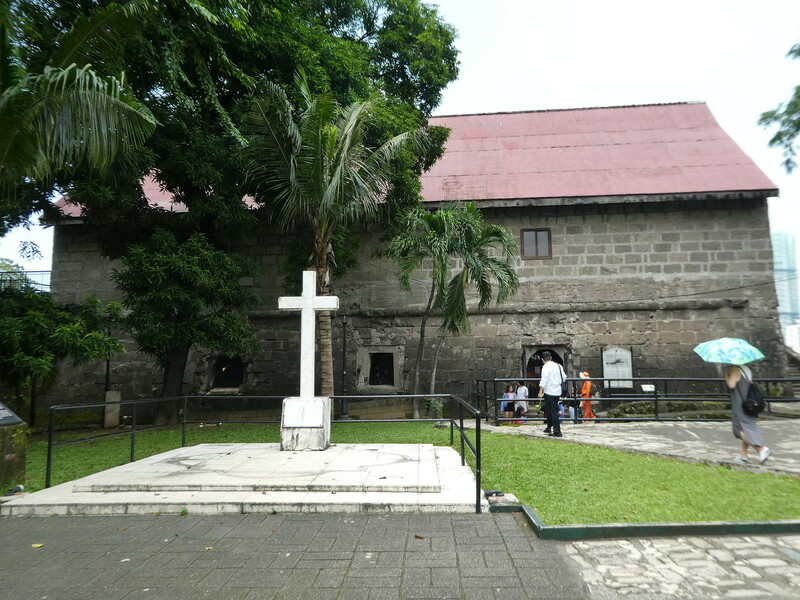 Before leaving the fort, we visited the Rizal Shrine which is a small museum housed in a restored section of one of the fort’s former barracks. 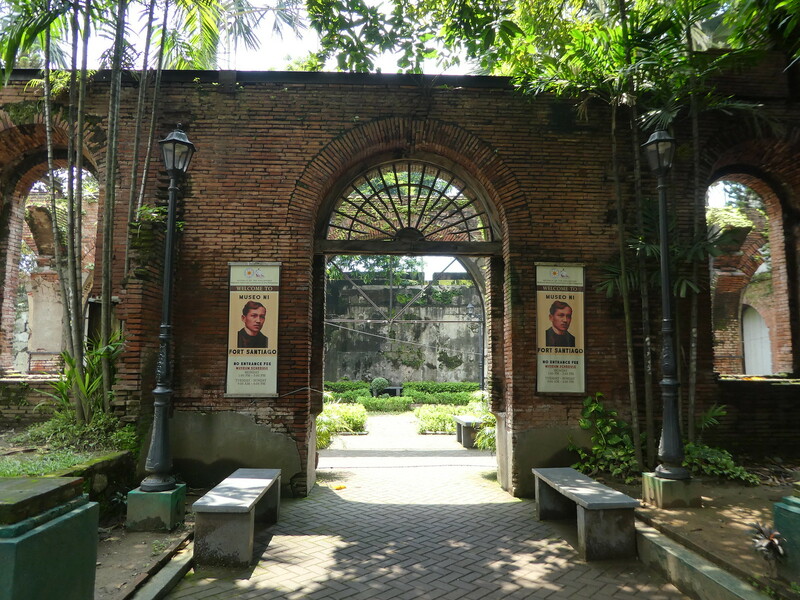 This museum is dedicated to the life of Jose Rizal, the national hero of the Philippines who was imprisoned there prior to his execution in December 1896. 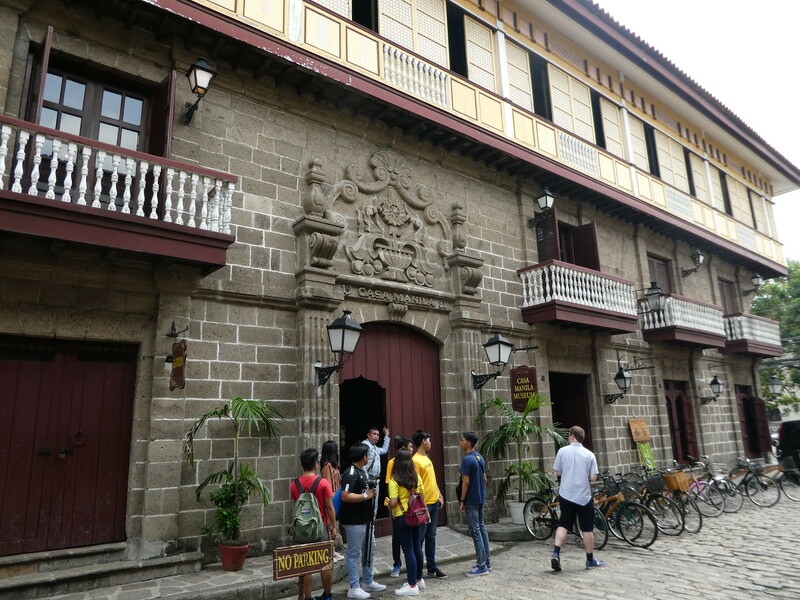 We then explored the splendid Spanish architecture along the narrow streets of Intramuros. Having shaken off the horse and cart vendors earlier, in this neighbourhood we were inundated with men wanting us to take tricycle tours and sell us straw hats but a firm wave of the hand soon disposed of them. 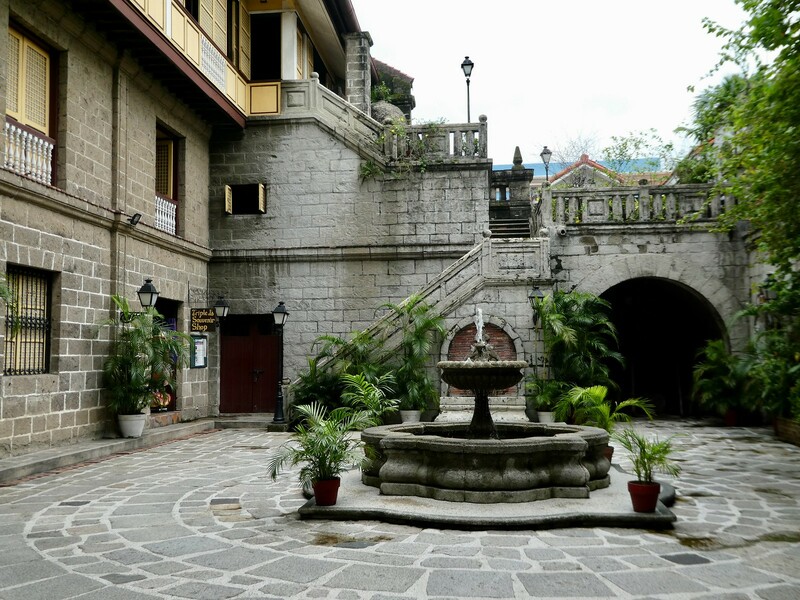 Along one of the cobbled streets we came across the Casa Manila Museum which is a re-creation of a typical upper class colonial Intramuros home. The interiors were filled with antique furniture, paintings and other artefacts from the Spanish era. Rooms had been carefully arranged to illustrate what life was like for wealthy families of that period. The house had a very attractive courtyard with climbing plants clinging to the old stone walls. 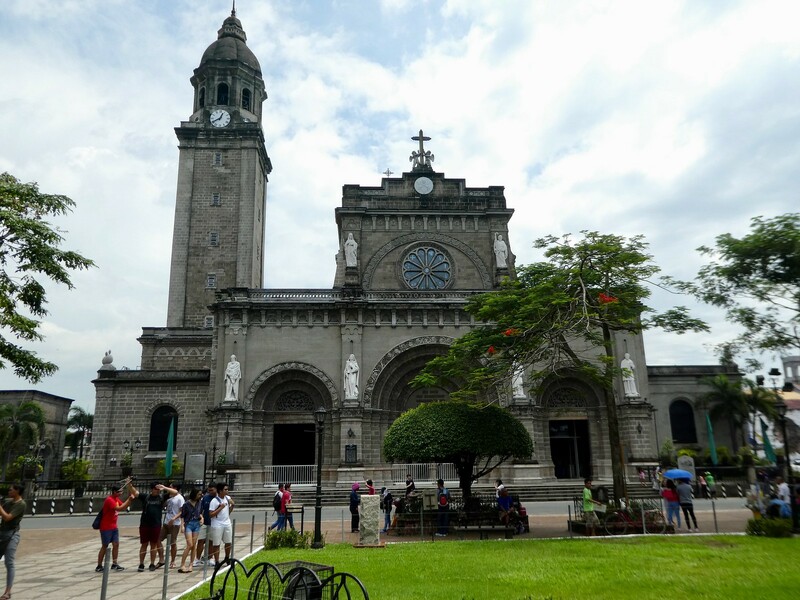 A short distance away stands Manila Cathedral which we had hoped to view but was closed at the time of our visit for a private service. Continuing along the narrow streets we passed a mix of beautiful colonial buildings with ornate ironwork balconies interspersed with poorly constructed wooden shacks. By early afternoon the warm sunshine gave way to storm clouds with bolts of thunder being audible in the distance. Not wishing to get soaked, and having seen most of Intramuros we decided to return to our hotel. With public transport being virtually non existent apart from open backed Jeepneys we decided to take a taxi. The previous day we had taken a Grab taxi which had been arranged for us by a clerk at the airport who suggested we download the app so that we could order them ourselves. Spotting a branch of Starbucks, we popped in for some drinks and took advantage of their free wi-fi to arrange transport which arrived in 8 minutes. Our 20 minute journey back to the Sofitel cost only 210 Peso (£3) making it very good value and kept us dry in the heavy rain. 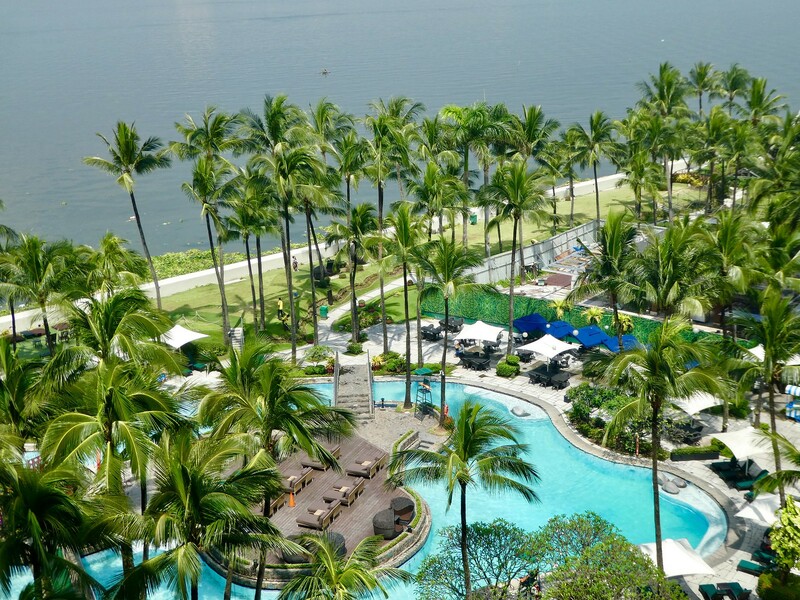 Fortunately, blue skies returned soon after returning to the hotel so we changed into our swimwear and relaxed under a palm tree around the lagoon pool for a couple of hours. Later, we tried to organise another Grab taxi to take us to the Singing Cooks and Waiters Restaurant a short distance away but at 6.30 p.m. on a Friday evening this proved to be an impossible task. Instead, we spoke to the hotel’s concierge who quickly arranged a regular taxi for us that had just dropped off passengers at our hotel. The taxi should have taken ten minutes, a distance we could have easily walked had the area been pedestrian friendly but a combination of busy roads and a lack of pavements made that a bad idea. The taxi sped down the hotel’s long driveway but turning onto the main road soon became gridlocked in a huge traffic jam resulting in our journey taking 35 minutes. The meter slowly ticked on with 117 Peso (£1.50) showing when we finally arrived at the restaurant. We expected there would be an additional charge for the length of journey but this wasn’t the case and I felt a bit sorry for the driver when he told us the traffic was like this most of the time. We like to think of ourselves as punctual people always arriving on time or slightly early but we were 20 minutes late as we entered the restaurant. Gladly, this didn’t seem to matter and we were soon relaxing at the Singing Cooks and Waiters Restaurant. 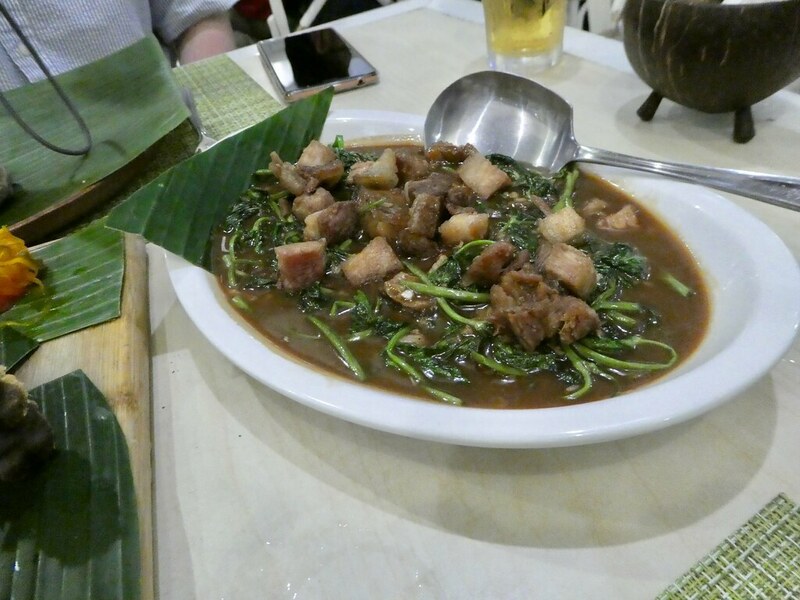 The extensive menu offered some mouthwatering dishes including Crispy Pata, a deep fried pork dish that was invented by the founder of the restaurant. As this is one of the most popular dishes we decided to try it, and it was easy to see why as the meat was so tender it just fell away from the the bone as it was served. 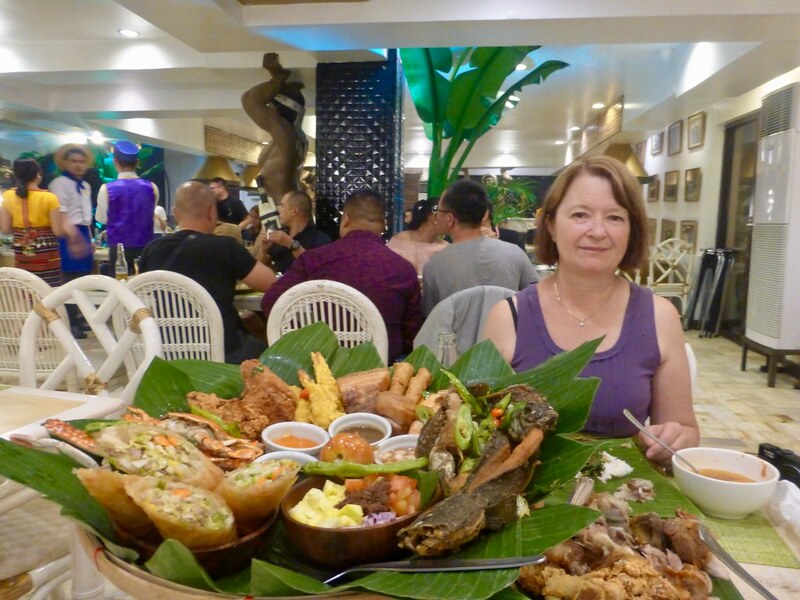 We were also tempted into ordering the Mama Chit Special – a huge feast of fried meat, fish and seafood served on a large platter which we tucked into whilst enjoying the entertainment. Cooks, waiting staff and a house band line up on stage and perform singing and dancing routines dressed in their uniforms waving frying pans and using fruit and vegetables as props for the cabaret sets. Guests are invited up on stage to join in with some of the songs and activities making it a unique and fun way to enjoy an evening out in Manila. I recorded a video of some of the show cooking, singing and dancing to give you an idea of what it’s like and hope you enjoy it. Mixing food with entertainment is the Singing Cooks and Waiters recipe for success. Often this results in mediocre dishes but both are of a high quality at this restaurant. There seems to be a general sense of fun and the energetic staff have developed a way of making it seem very natural to be dancing around tables and bursting into song. I’d definitely recommend an evening there whilst visiting Manila as it’s a truly memorable experience alongside delicious food. 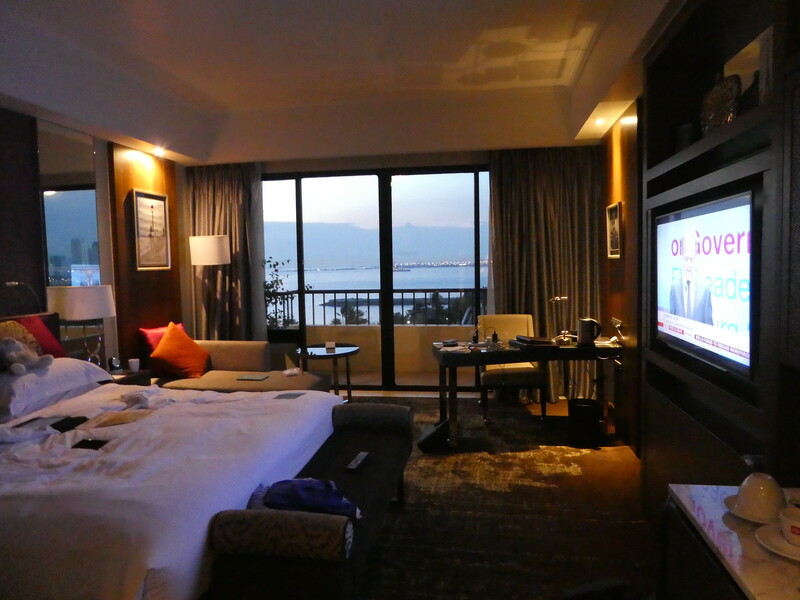 My husband and I had a delightful time at the Sofitel in Fiji years ago on our trip to Australia. It was just the right amount of indulgence between working and relaxing before beginning our hike in New Zealand. I love the photo of the entrance way to the Fort and your description of the day; it was like being there with you. Enjoy your travels! Thank you so much for your kind words.i would like to visit Fiji someday. Wow! That was a fun post. Thank you for sharing. I had no idea Manila was so interesting. It’s so good to taste and experience new cultures. There is something enchanting about old colonial buildings that I just like so much, no matter where in the world is it. Your writing style is also on point, you made me feel like if I was also doing the trip which is awesome. Thank you so much for your kind words Nanyi. It’s so lovely to read that you are enjoying my blog. Thank you so much for your inspiring words. It’s so nice to read that you enjoy my posts and I definitely want to visit Cebu the next time I’m over in the Philippines. Hope it won’t be too long. Yes, I’m sure you will love it here. So much history, culture, and everything else…especially the world-famous Lechon. The beach, the city, the mountains are all in one place! Can’t wait to read about it when you’ve made it to Cebu! Definitely Monique, I really want to do that! 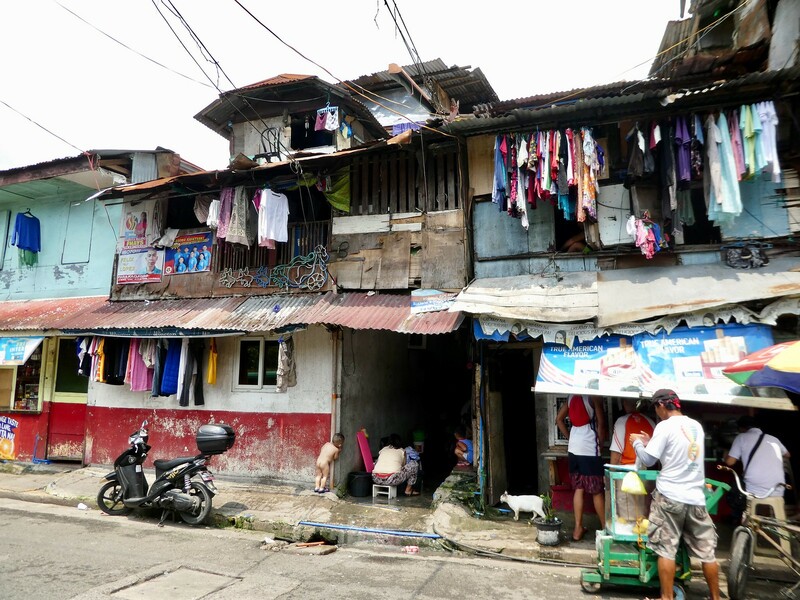 Once again you’ve covered the charm of Manila pictorially and even one shot of how the majority live. Like every country there is a sharp divide between the haves and the have nots. Maybe in Asia it’s a bit more honest. What you see is what you get without any cover ups. I’d like to once again caution to take taxis that the hotel recommends. The food in Manila was extremely good Jason and we had a great few days there. Fortunately the say of protest turned out to be just a large gathering of people and it was all very peaceful. 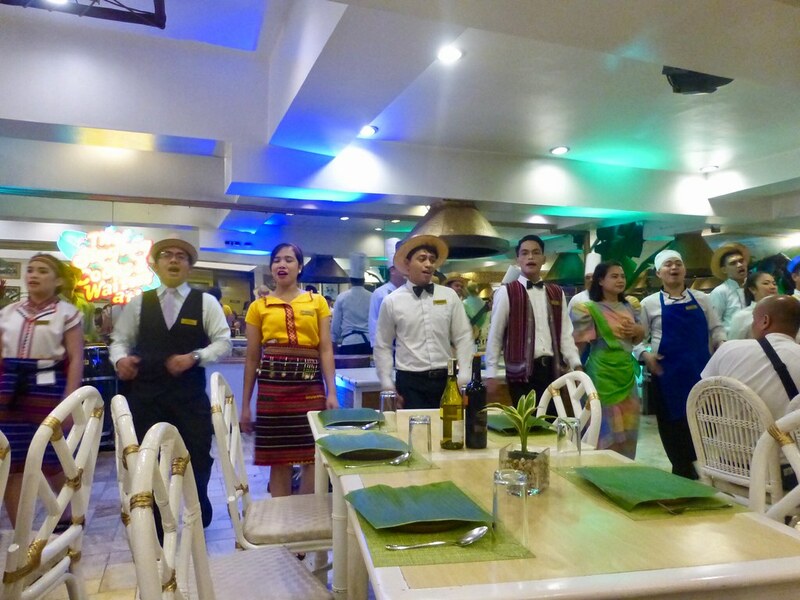 If you do go to Manila try and spend an evening at Singing Cooks & Waiters. It was so entertaining and quite cheap by UK standards. Beautiful pictures. It looked like it was so much fun! Thank you. We had a lovely day in Manila. Thank you so much for your kind words. I hope you have an opportunity to visit the Philippines soon. Thank you for your much appreciated thoughts. I’m pleased you enjoyed this post. The food at Singing Cooks & Waiters was delicious, you could never go hungry there! Thank you for your kind words. My maternal grandparents were stationed in the Philippines twice, once when my mother was a child, and then just before WWII. Granny came home, but Granddaddy stayed. I never met him. So I always am glad to see pictures of the country. Your talk of horse-drawn carriages reminded me of a story Granny used to tell. The first time the family was there, horse-drawn carts were the norm and the rule was only male horses/stallions were allowed on the streets. Occasionally a farmer would try to sneak a mare in to use. Havoc reign when the stallions got a whiff of her. Granny said it was quite a sight. My mother used to tell stories of going around to various houses at dinner time to lick the ice cream paddles after the dessert had been made. So nice to read about your grandparents associations with the Philippines Sarah. Thank you so much for your welcome thoughts. Manila was very interesting and I’d like to return to the Philippines to visit some of the smaller islands sometime Marcus. Thank you for your ever welcome thoughts. I enjoyed my visit to Manila with you. The descriptions and words were so informative. the singing cooks remind me of the fun that people enjoy when visiting Pike’s Fish Market in Seattle, Washington. While there is no singing, the crowds are very much part of the colorful scene as shoppers select their fish (then it is thrown to another worker to be wrapped up for them). Thank you so much for your kind words. I visited Pike Fish Market about 20 years ago and would love to return to Seattle sometime as it was only a short visit. Thank you so much for your kind words. I’m so glad you enjoyed this post. You’re welcome Little Miss Traveller ! Oh, this is great! I think the waiter who sang ‘O Sole Mio’ on our cruise ship was Filipino. He seemed to be enjoying it as much as we were. Thank you for your kind words. The evening meal with entertainment was a perfect end to the day. It was a fun filled day exploring Manila and ended with a memorable evening at the Singing Cooks and Waiters Restaurant.